Click on the photo and see all the photos of DORMERO Hotel Frankfurt. Restaurant, Room service, Bar, Breakfast in the room, Sauna, Fitness centre, 24-hour front desk, Newspapers, Express check-in/check-out, Luggage storage, Concierge service, Terrace, Laundry, Dry cleaning, Ironing service, Shoeshine, Daily maid service, Meeting/banquet facilities, Fax/photocopying, Non-smoking rooms, Facilities for disabled guests, Lift, Soundproof rooms, Heating, Non-smoking throughout, Air conditioning. Located just 100 metres from the Frankfurt Trade Fair, this 4-star superior hotel offers a sauna. All rooms at DORMERO Hotel Frankfurt Trade Fair come with free Wi-Fi, free Sky-TV and complimentary minibar drinks. 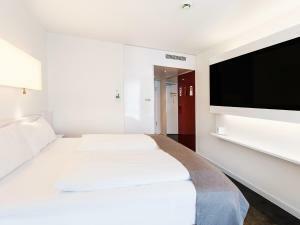 The rooms at the DORMERO Hotel Frankfurt Trade Fair feature modern, white decor and a granite-design bathroom. Individual lighting, and unlimited movies are also included in each room. A buffet breakfast is served each morning in the elegant restaurant of the DORMERO Hotel Frankfurt Trade Fair with its wooden floors and stylish artworks. Drinks are served at the air-conditioned bar with its chic lighting and lounge area. The DORMERO Hotel Frankfurt Trade Fair has its own private car park for guests. Messe S-Bahn Train Station is just 300 metres away, and Frankfurt Central Station can be reached within 3 minutes by train. Guests using a satellite navigation system should type in the address Europaallee 64.